Starting off the month of May is Dia Del Nino (Day of the Child). On Sunday, May 2, "Vamos al zoologico!" -- "Let&apos;s go to the Zoo!" Join the #1 family Zoo in the U.S. for the 5th annual cultural festival celebrating children. This one day celebration features a variety of family activities and entertainment including live music from local Latin artists, bilingual talks, dance lessons, Hispanic food and more. Dia del Nino, is celebrated in Mexico and other Latin American countries on various days. The following weekend, treat Mom to a day at the Zoo. 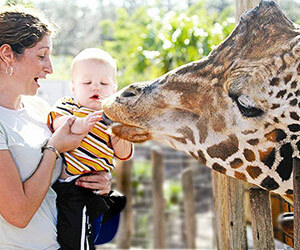 Saturday, May 8 or Sunday, May 9, bring Mom to Tampa&apos;s Lowry Park Zoo for Mother&apos;s Day and she gets in for free! Mother&apos;s Day weekend, all moms receive free admission with the purchase of their son&apos;s or daughter&apos;s ticket. Enjoy a relaxing day with the family in the beautiful Tampa Bay weather while learning how mothers of all species care for their offspring!